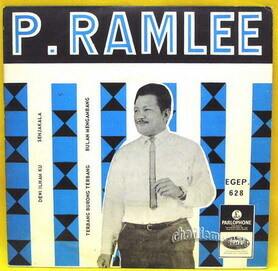 EP P. Ramlee – Parlophone EGEP 628 (1967). A record cover with triangular patterns used as the background. Bold san-serif fonts composed on black strip used as the main title and the black and white cutout image of the artist is placed on the foreground.